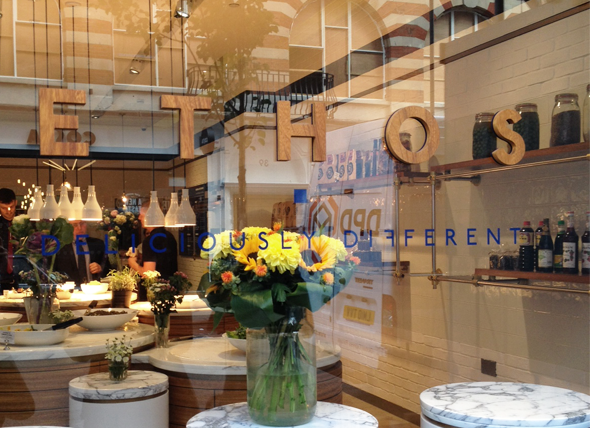 We are delighted to announce the official opening of Ethos Foods in London’s Eastcastle Street, taking place on Monday the 22nd of September. Ethos Foods is a sophisticated, self-service restaurant, conveniently located near Oxford Circus and specialising in deliciously healthy meat-free cuisine. I-AM worked with founder Jessica Kruger to bring the concept to life, helping to develop the branding and interiors. The design is based around the idea of the ‘fruit of the forest’, referencing to the natural ingredients used in the menu. As such, it features 4-metre high silver birch trees, which are a central feature of the space and add an organic element to the neural-chic palette of blues, golds and silvers. The materials used range from stainless steel to Calcatta marble, for a striking and chic effect. The design and layout is intended to complement the colourful array of dishes on offer. The food features a selection dishes from around the globe, resulting in exciting and attractive flavours. Some signature dishes (and personal favourites) include Thai corn fritters and Hyderabadi Scotch eggs. These are served on elevated circular counters, which give the idea of abundance and tempt diners to try them all. Diners can mix and match to their liking and pay their meal according to weight. If you need a refuel from all the shopping, why not make your way there and check it out? Ethos is open for breakfast, brunch, lunch and dinner and offers both dine-in and takeaway options.